Visual acuity, or our ability to see detail, is one of our most important visual functions and is used every day. It determines how well we can read, how well we can see people in the distance and how we manage with detailed visual tasks. However, our visual space is not limited to our detailed central vision. Peripheral and para-central vision is also critical in our everyday lives. We measure peripheral vision and the extent and completeness of the visual field with an instrument called a perimeter, which is computer-driven and therefore automated. When doing perimetry, you are required to look directly at the central light of the perimeter bowl. Other lights of varying brightnesses flash, one at a time, anywhere in the central and peripheral fields. You have a response button to press each time you notice one of those lights flashing. It normally takes about ten minutes for each eye to take a detailed field measurement. Changes to the fields of vision, either the central or the peripheral field, are often a critical sign of serious eye and neurological conditions; these include glaucoma, intracranial tumours and stroke. 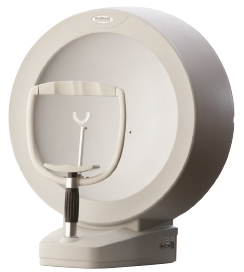 Visual field testing, also called perimetry, is particularly important in patients at risk of developing glaucoma and those on certain systemic medication.